If you’ve ever seen those shows on the Discovery channel, like this one, where they take a much-loved classic car and revamp it, you’ll know exactly why the way that something looks is so important. These expert mechanics know that how the final product is presented can make all the difference between a satisfied customer and a delighted one. And this rule of thumb is applicable to pretty much every enterprise. For us at AudioCodes, it’s safe to say that this is very much part of our vision. Not only do we design and build best-of-breed VoIP products and end-to-end solutions that you can rely on, we also make sure that they are visually appealing and easy to use as well. The AudioCodes SmartTAP 360° call recording solution illustrates this point perfectly. SmartTAP 360° is an all-in-one compliance recording solution for Microsoft unified communications deployments (and other environments too, thanks to its SIPREC support) that enables the capturing and indexing of customer and any other organizational interaction. SmartTAP 360° already has plenty of fans in the field, but we wanted to make it even better. To this end, SmartTAP 360° V4.3 will introduce a completely redesigned user interface. 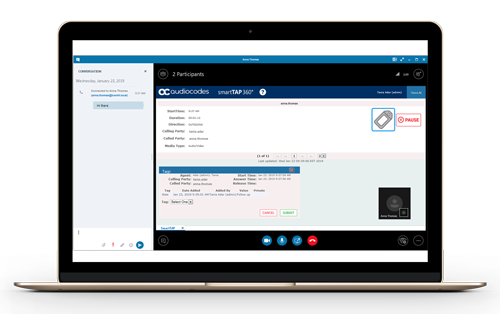 This all-new UI will bring SmartTAP 360° under the umbrella of the AudioCodes One Voice Operations Center (OVOC) network management solution. The same crucial data that organizations of all sizes already rely on is still available, but is now presented in a clean and intuitive drill down, web-based application. Additionally, there are some enhanced views, features and administration tools to help make life even easier. Users can now be provisioned in SmartTAP 360° via Active Directory and single sign-on for ease of use. Then, at a glance, administrators and supervisors can gain information and knowledge on specific users from the User Status window. Color-coded icons make information retrieval and navigation quick and straightforward. In addition, managers can see which recordings are currently taking place, start a recording manually, see active calls and listen in to live recordings. To top all this off, SmartTAP 360° V4.3 also boasts enhanced security, compliance and alarm functionality. Within the new UI, administrators and managers can view detailed information and statistics, such as complete audit trails of all user activities, call tagging and other metadata, and license resources and managed devices. Threshold and system alarms include “no recording” warnings, storage statistics and health checks. So, the next time you see a vintage Chevrolet Corvette being restored to showroom condition and making its new owner very happy indeed, we want you to know that the same attention to detail and concern for the user’s experience goes into our products as well. We think that SmartTAP 360° V4.3 proves that nicely.